I see via InstaPundit that there's some dirty-trickery at work from the Obama campaign. It reports a site that claims Palin is in favor of gay marriage. What I find most interesting, though, is that the Obama campaign thinks it has more to gain by spreading that rumor than by spreading the truth. Palin is, as I gather from what I've read about her in the last day or so, actually strongly opposed to gay marriage (as are most Americans) but also to civil partnerships (which most Americans support). Obama himself took that very position in his recent speech: anti-marriage, pro-unions. So why is it that his campaign is going to the trouble (and risk!) of running this attack, instead of just pointing out the truth? It's an odd thing to do, when they could presumably benefit with swing voters more by simply telling the truth. The Clinton Democrats have sent another letter. I assume that most of you are either Republicans, or non-Clinton Democrats, so you probably didn't get the letter. It's interesting reading, so I'll post it here. Dear Clinton Dem, Hillary touched us all so much and, by example, showed us to look into ourselves and find a strength we never knew we had. We found the power of our voice, and the power of our votes. The suffragetes would be proud! The selection of Senator Palin by McCain is bittersweet. Hillary was "The One". The choice of Palin just puts an exclamation point on the failures of the democratic party this election, and serves to highlight the ego-driven decision Barack Obama made to slight Hillary Clinton as his VP Choice. Had he joined forces with her right after the primaries, we may be looking at a whole different landscape, but the choice of Palin has irreversibly changed the scenery. John McCain put his ego aside and did what was best for his party -- and possibly his country. Palin's policies are very different than some of ours, but she is a woman and a mother that has endured many of the same challenges we face every day. She has dealt with the same sexism and misogyny that Hillary has been pummeled with, and now we see Democrats in power treating Sarah much the same way they treated Hillary. I am embarrased by the mean, small minded people that are the top of leadership in the so-called democratic party. The party of inclusion has become the party of exclusion and ridicule. Who has not been insulted by this campaign? Women have been abused, lower-income people (bitter, clinging to their guns & religion), we've been called "low-information voters", "uneducated", and "hags". African Americans that don't worship Obama are "Uncle Toms". Those that believe the right to privacy were sold down the river on FISA. "Freedom Cages" were built to prevent free speech. All true democrats were cheated by the handling of Michigan and Florida and the suppression of a free and fair roll call vote for president at the convention. Hillary supporters were insulted endlessly and still. The party has lost it's way just as the Republican party seems to be reforming. It will be a difficult decision for Hillary supporters this year. Whoever you decide to vote for, please stay with us and help move the conversation forward. We are democracy. We are the one's we've been waiting for -- whoever we choose to vote for. It's fairly obvious that, whoever else wins out this year, Sen. Clinton has done remarkably well for someone who lost. Though she won't be President -- not soon, at least -- she has bought herself a place at the center of the Party for years to come. Doc Russia's maternal grandfather has passed, and Doc has written a moving eulogy. I know, now, that all of you have interesting life stories: here was another man who did. You may wish to read of him, and express your condolences to our friend at this time. DENVER - John McCain tapped little-known Alaska Gov. Sarah Palin to be his vice presidential running mate on Friday in a startling selection on the eve of the Republican National Convention. Holy Shiat, he did it. I didn't think he'd do it. She's from Alaska, she hunts, her husband is a Eskimo, they have 5 kids---hell, she's a pioneer woman. This is going to be an even more wild election than it already has been. 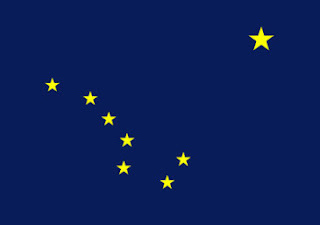 An interesting symbolic aspect of Sen. McCain's choice for VP: the flag of Alaska has a constellation on it, normally called The Big Dipper, which points to the North Star. The North Star is properly called Polaris, however; and the Big Dipper is properly Ursa Major, "the Big Bear," with the Latin taking the feminine form. Whether or not Gov. Palin will live up to that symbolism remains to be seen. I note it now merely for interest's sake. What Do You Want for a Daughter? What Does a Father Want For His Daughter? They take that oath a little more often, these days. But I don't think that would change how he felt one bit. Typically, nobody gets away with that in the US Army. Not that I expect the army to get any credit for policing its own, as it has done several times before in this conflict. I see that the Obama campaign has decided to attack a writer from National Review. His offense? ...the campaign's "Action Wire" has been waging large-scale campaigns against critics. That includes tens of thousands of e-mails to television stations running Harold Simmons' Bill Ayers ad, and to their advertisers — including a list of major automobile and telecommunications companies. And tonight, the campaign launched a more specific campaign: an effort to disrupt the appearance by a writer for National Review, Stanley Kurtz, on a Chicago radio program. Kurtz has been writing about Obama's relationship with Bill Ayers, and has suggested that papers housed at the University of Illinois at Chicago would reveal new details of that relationship. So: they don't dispute that they served on the board together? They don't dispute that the relationship was far deeper than Obama acknowledged in his 'just a guy who lives in my neighborhood' remarks? Yet Stanley Kurtz is a "slimy character assassin" because he says that Ayers recruited Obama onto the board of the Challenge? But that is the point at which Obama could reasonably claim ignorance of Ayers' history. That's no assassination: even if that claim were true, it wouldn't be damning, and if it's not true, it's not a heavy blow. This campaign is deeply sensitive to the Ayers situation. They've actually tried to get the Justice Department to investigate a group running an ad about it, even though they apparently have no factual disputes with the ad. They're afraid of this. Why? It's been in the public sphere for months. They decided not to count any of the votes. I would like to ask you to take time to read two modestly long pieces. I realize this is quite an imposition from a blogger, but there are some important issues here that I'd like to talk about; and as I look over the pieces to sort out how to approach it, I realize that we just really need the whole of them each. The first one is by Connie du Toit, where she draws on her world travels to question some basic assumptions about whether American-style freedom is right for the world. The second is by the historian John Lewis Gaddis, calling for America to rededicate herself to ending tyranny. The second piece is the more important of the two if you have only a little while to devote to it (no offense to Mrs. du Toit, who has written a thoughtful and deeply-felt piece). If you can read them both together, however, I think you'll profit from it. When you've done the reading you can afford, let's talk about the issues raised. AFSCME is one of the strongest of the Democratic Party's support bases, because it's about public sector unions. Public sector unions are all about bigger government, so the establishment of new massive Federal bureaucracies to oversee health care or "a civilian national security corps" are right up their alley. If they're having trouble with the rank and file in AFSCME, they've got trouble indeed. 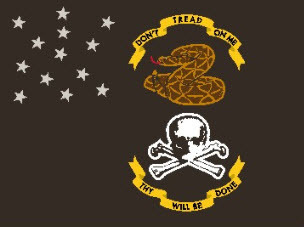 The early part of the story suggests that it's trouble that is coming from the fact that these blue collar gentlemen admire McCain -- and indeed, the unions draw heavily from veterans. 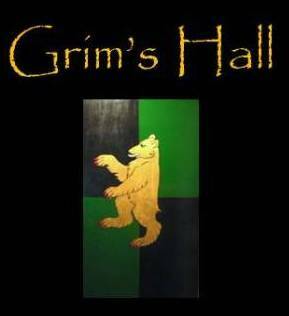 Grim's Hall has long supported Helmets to Hardhats, which assists veterans in finding such jobs. It's not really shocking that veterans admire McCain and value the kind of leadership he showed during his military career. Afraid? To say, "The boys downtown say we have to hand this stuff out"? Here's the question: are the union presidents claiming fear in order to resist HQ's demands that they hand out literature when they don't support Obama? Or is it possible that there really is such massive resistance to the guy that a union president would really be afraid to do it? A couple of conservative ladies, Rachael Lucas and Cassy Fiano (not our own Cassidy), have been talking about a piece printed in Oprah's magazine. The piece is another of the genre I would describe as "wives mocking their husbands in major publications." There are a number of good reasons to disdain the trend, and I won't add to what the ladies have to say on the subject. On the other hand, I would like to draw a distinction between such pieces and the pieces of crockery that Ms. Lucas was mocking last week. The two things are similar, but there is a signal difference between them: one is an example of mocking a particular person as an expression of anger, while the other is mocking a class of people as an expression of humor. Moreover, I think this kind of humor is broadly good and healthy. As long as it remains nonspecific -- as long as you aren't using it to hurt someone in particular -- it is a useful way of dealing with the inevitable tensions between the sexes. The fact that such tension exists is not evidence of hatred. It's normal for humankind. The Greeks confined women out of public life to keep such tensions down in an otherwise robust democracy. 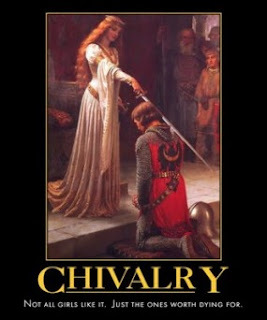 The Medievals had a number of mechanisms for resolving the tension, at least one of which -- the courtly love concept -- really needs another look from scholars, who have misread it as adulterous. If he won't oblige me and leave? And I'll sing of sadness and grief! Or, if you would like, consider this collection of bawdy songs. Close to the front of the podcast are a pair of these songs: "Beer is Better than Women" by Axel the Sot, and "The Cucumber Song" (which I will not quote at all -- if you want the lyrics, you'll have to dig them out yourself) by Iris and Rose-Wild and Thorny. Neither of them are at all clean, and if you took the lyrics at face value, they'd both qualify as "hate speech." But they're not hate speech. When Axel the Sot is singing the chorus with the audience, and says, "Now, just the ladies!" everyone -- man and woman -- bursts out laughing. It's inevitable that human sexuality produces irrational tensions in our lives that we have to deal with some way. Humor is one of the better ways. Certainly, there are rules. It should never be used to hurt or to mock any particular person, but "men" and "women" are both fair targets. That means you shouldn't mock a man or a woman, but you can mock "wives" or "ex-wives" or "husbands." We do have to remember to keep it in its proper setting. It may be fit only for the tavern and never for the office; for private play among friends, or for obviously over-the-top shows like the old Married with Children. It's not hate speech, though, and it's not bad. In its proper place, resolving these tensions is part of keeping life merry. I have never enjoyed a political convention as much as I've been enjoying this one in Denver. Wizard-hat (fails) to levitate the Denver Mint! Fellow activists, chanting "Love, Peace, Justice," turn into a lynch mob! Obama to accept from a mini-Greek temple! Fireworks! Hillary Clinton fans fighting with Obama fans on the floor! Bill Clinton "hypothetically" asking why you'd vote for someone who can't deliver because of inexperience! Hillary herself giving a test-run speech that doesn't name Obama! Honestly, this is the best convention anyone has ever had. The Republicans don't have a chance of topping this. UPDATE: I'm staying up to watch Sen. Clinton. The "no Obama" practice speech was obviously just to mess with him. She isn't much of a speaker, but tends to boilerplate delivered as boilerplate. Only one thing she said got my attention, really, aside from her underground railway metaphor: "Putin in Georgia, Iran in Iraq"? This is the issue she wants to raise? Getting Iran out of Iraq? Getting Putin out of Georgia? Obama would do that how? All the rest she says about Iraq, or foreign policy, is about getting the troops home so we can provide them with health care. I will say this, though: the lady sure can hit when she wants to. Her "my mother / my daughter / Harriet Tubman" piece was the best I've ever seen her. She's tough. The Democrats will miss her after tonight. I met Michael Totten in Iraq. He's a good guy, an adventurer who has wandered across Turkey into Kurdistan, through Lebanon, and now is traveling in the Republic of Georgia. He has a report on the recent conflict. Read the whole thing. It's possible that Totten is being fed a line by his hosts: but having met him, I'd expect him to see through it if such a thing were attempted. So you have a couple acres, hate to mow, and are looking to cut down your food expenses somewhat? Buy a cow -- a minicow. The Dexter, a mountain breed from Ireland, is perfect for cattle-keeping on a small scale, but other breeds are being artificially created to compete with it, including the Mini-Hereford and the Lowline Angus, which has been developed by the Australian government to stand no more than 39in high but produce 70% of the steak of a cow twice its size. In one of the posts below, I asked Elise to tell us a bit about herself -- she's become a regular in our discussions only recently, and so we don't know her as well as many of us know each other. It occurs to me, however, that she doesn't know all of us either; and there are some of you who read the page regularly but only occasionally comment, who might want a chance just to say hello. So: this post is just for everyone to take a moment in the comments and post a brief introduction. You can tell us whatever you like, and leave out whatever you like -- but feel welcome to tell us all you want about yourself, your upbringing, your philosophy and your religious sentiment if you like, major influences, whatever comes to mind. No one has to do so, of course; but I expect it might be interesting.